My best friend Kelcie's second baby's due date was mid January. They had no idea the gender of the babe, as was the same with their first kiddo and Josh and Kelcie decided on another home birth. And so it was home birth number two in their cute little craftsman on the South Hill of Spokane. Kelcie had intended on a birth photographer to be present for capturing the moment and I was going to be there to take care of Landon. You know, military families don't always have family close so we become each other's family. So I was totally ready to be on call for watching Landon and supporting my friend. But then Kelcie's original planned photographer had dates where should would be out of town. Kelcie then asked if I would be willing to fill in incase baby #2 came earlier than anticipated. I of course said yes!! Although, a bit unsure of how I would be able to document a birth and watch a 20 month old I was still excited at the opportunity if it came. Fast foward a couple weeks and Kelcie's labor started. Contractions started to get closer and more intense. And so I was put on alert. It was a Friday and so Josh's parents drove in from the west side of the state, which is no small feat in the winter while driving over Snoqualmnie Pass! God made a clear pass for them to come and they arrive the evening of the 5th. And so if baby decided to come that weekend I was free from Landon duty. It was just a big waiting game then. Kelcie kept me updated all weekend and told me she would call me after the midwife was called to come over. And so in the middle of church Sunday morning I got a phone call from Kelcie saying it was go time! The midwife was on the way. Kelcie thought this birth would be similar to her first and so she told me not to rush over. But you bet I did rush right over. Once I heard my best friend experience a contraction over the phone I wanted to be by her side (and where the action was). I showed up after church with my go-bag (yes I had an overnight bag packed and with me all weekend, now I know how our military peeps feel!). Josh's parents were in the kitchen making brunch and the midwife was doing her thing! The boys were blowing up the birthing pool in the living room and Kelcie was sitting on her birthing ball eating a breakfast burrito like no big deal. So chill. This was my first experience with a home birth and I must say walking into the scene it was very relaxed. I would explain homebirth in one word, PATIENCE. There was no rushing, just paying attention to how her body was progressing naturally. It was beautiful. The midwife had to break Kelcie's water because she probably could have labored forever without it being broken (same thing happened with Landon). Once that happened things got rocking and rolling. Contractions intensified tenfold and Kelcie relocated to the pool. While sweet Landon went down for his nap Kelcie labored in the pool. And less than an hour after her water broke with 4 big pushes their beautiful daughter Claire was caught by her doting daddy at 12:24pm on January 7th, 2018. It seemed like time stood still as I tried to keep it together while capturing the first moments of Claire's life. To say that was difficult is an understatement. It was the first birth I have ever experienced. I wanted to get on my knees and sob so hard in gratitude for this little life and the path God will have for her on. 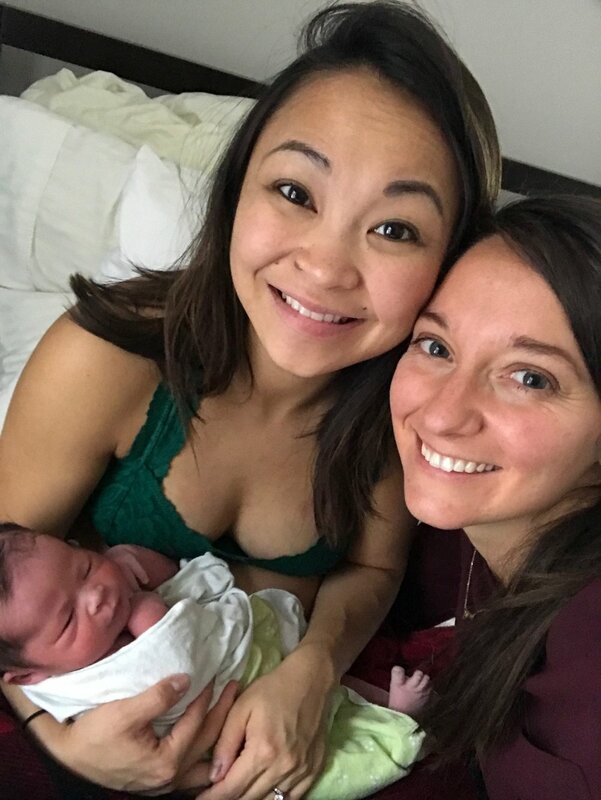 I wanted to cry in relief for my best friend because she just gave birth naturally. And cry and pray I did. It was the most beautiful thing I have ever witnessed and I was able to experience that with my best friend.